I'd like to gather a list of what people consider the best places to hike, climb, backpack, and trek worldwide. Some that come to mind for me are the Grand Canyon in Arizona, North Cascade portion of the Pacific Crest Trail, The Lycian way in Southern Turkey, and climbing Kilimanjaro in Tanzania. Do you have a favorite hike? it can be short or long? I love camp Muir three of the four seasons no matter if it is a day hike or a summit bid. The 8.4 mile Syncline Loop in Canyonlands National Park, Utah is 5 stars. It has a bit of everything from route finding to easy rock climbing (no rope needed), all set in an incredible desert wilderness. Thanks! Canyonlands is a great area, another favorite near Moab is Corona Arch. 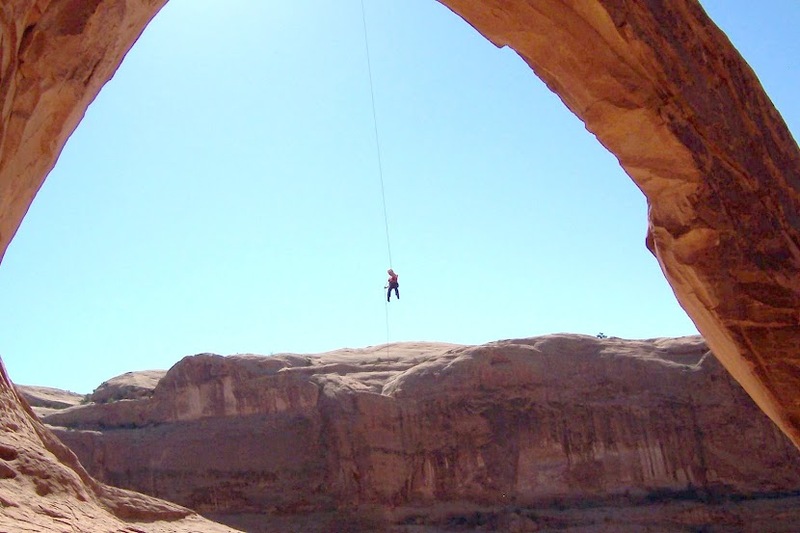 Here's a picture of one of our friends rappelling off it. For a friendly and enjoyable coastal walk hard to beat Wilsons prom in Australia. Great beaches to camp on, that is not reachable by cars and not too difficult a terrain. Hi all! Very first post - COOL! I'm new to hiking/mountaineering. Close to home I like Devil's Lake, WI. Last summer I did the hike into Supai and Havasu/Mooney Falls. It was fantastic! Later this spring I'm attempting Mt. St. Helens. It is true that Mount kilimanjaro is favorite climbs and hikes in the world.Reasons are vivid and many travelers who have climbed kilimanjaro can give their testimony. First of all, mount kilimanjaro is the largest free standing mountain in the world, one of 7 world summits together with Everest, Denali, Ancocagua e.t.c. Further more Kilimanjaro was selected to be among 7 new natural wonders Africa. I love so many hikes, and for different reasons. The two that come to mind are Lower Cathedral Lake from Tuolumne Meadows in Yosemite. This is special because it was my reintroduction to backpacking. I took my beloved 8th-grade class for a week in the back country. Another favorite is the Mt. Lassen Peak trail. It's a 5 mile up and back that summits at 10.4k with spectacular views. And, you get to hike an active volcano! I did this yesterday with my 11-year-old daughter. It was her first time above 10k!